I did a sh ort visit to Edinburgh earlier in the week and had a productive meeting with Chris Fleet who manages the maps collection at the National Library of Scotland. He is pioneering work in making a wide range of historical mapping available online in georeferenced form. We are hoping to do similar for Manchester by creating a custom historical web portal. 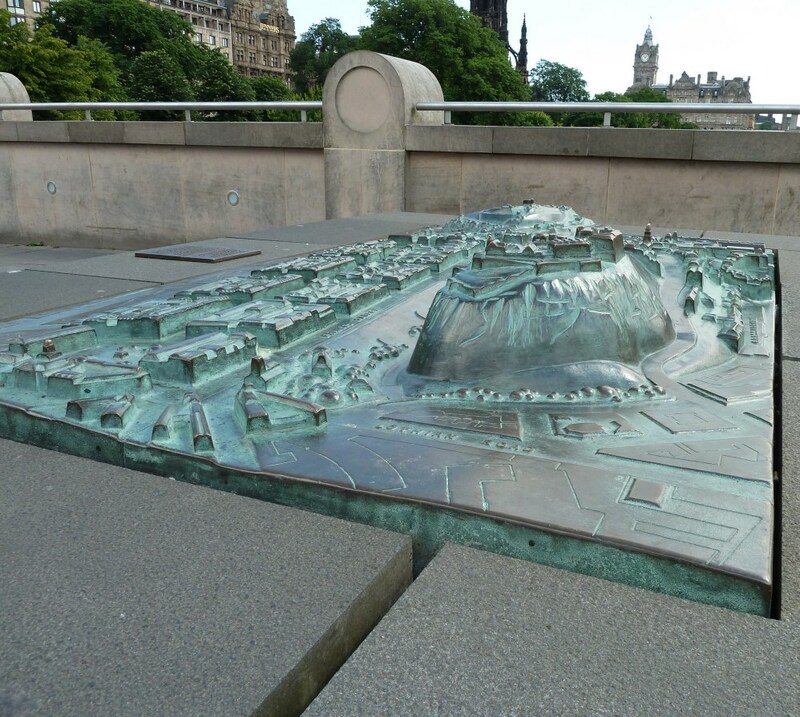 While exploring Edinburgh for a few hours I also came across a really nice bronze tactile map of part of the city on display near the National Gallery of Scotland. Firstly, a positive review of our edited book Rethinking Maps (Routledge, 2009) by Daniel Lewis has just been published in the journal Environment and Planning B. The review starts "[t]his collection of essays marks a milestone of scholarship in critical cartography, a discourse most notably augered by the seminal work of John B Harley collected in The New Nature of Maps (2001). This collection moves forward from Harley and provides a timely summation and spur for future research in maps and mapping." Nice. The review also mentions specifically the value of our introductory chapter and concluding 'map manifesto' in the book. These two chapters are online 'unofficially' in uncorrected page proof versions. Secondly, our Mapping Manchester exhibition was reviewed by Adam King and Mark Sansom in Maplines, the newsletter of the British Cartographic Society (winter 2009 issue). A little late to blog this but I've only just got hold of the review. The exhibition itself finished in April but you can get a sense of the content from the e-catalogue. We have hopefully now got a publisher for a comprehensive 'coffee-table' book version of exhibition and will be signing a contract soon. Although, the book itself won't be complete for at least another 18 months. I was in London last week and went along to the British Library to visit their new mapping exhibition. The exhibition represents an impressive effort in terms of staging and marketing - with big cross over support. Obviously lots of institutional support for the exhibition and therefore maps, which is encouraging. But I thought it was boring, and felt rather old fashioned, snobbish. Reifying the map as art object. Walking through the collection, overall, seems very samey - ye olde 'classic' feel. Many maps displayed are largely black and white or with faded colours (The cartoon maps stand out with their bold colour). Felt very disconnected from present excitement around mapping. Why so backward looking? Too many old European city/regional maps - I don't think thes work well - little connection to English audience. Needed more maps of Britain. There seemed to be a scattergun selection of locational themes for the maps. Many of the really old Medieval Mappa Mundi maps are rather meaningless I always think in terms of public display - we've completely lost their historical context. They are merely weird pictures and strange shapes, and not really mapping. There only seem to be 2 really contemporary maps and they were rather lost amongst the throng of oldies, especially the Grayson Perry's 'Map of Nowhere' that was tucked away in a corner. 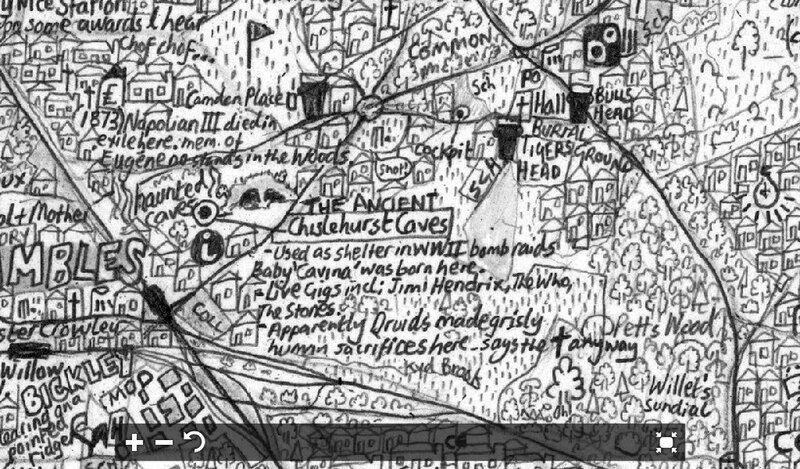 'The Island', by Stephen Walter, an immensely detailed hand-drawn imagined map of London, is actually fascinating up close. I spent quite a while finding the different places I've lived in London. I would have liked to know how some of the maps in the exhibition came to be in the BL and how, if ever, they are used by historians. Gallery space for exhibition was so so, rather disjointed being split into smaller room. Some rooms were rather cramped, with low ceiling and low light. Felt corridor-like. Some lighting also creates significant shadows on the maps. Audio commentaries for several exhibits were annoying after a short while. I felt the captions were a bit short and lacked meaty details. But difficult judgement call - its meant as a public exhibition. Several cabinets of globes but these don't really fit well and could have been dropped. Digital magnifying glasses for a couple of high profile examples don't really work. No other digital mapping or interactivity. The vertical wall mounting is good as people can get up close and point things out. Opens space for shared discussion around the map. But also feels weird, too much like an art show with 'dead' maps mounted in picture frames, safely behind glass. Rather than mapping that is performed and does work in the world. Lots of merchanise tie-ins, although all rather predictable - no surprises or charm. No real intellectual challenge to take away from the exhibition except the catalogue book. Selection criteria not clear. Some don't (superficially) *look* that magnificient. No obvious chronological story told - which might have given it some narrative sense. Not convinced by their grouping of exhibition into genres of display space (the palace, the merchant's house, the school room, etc). The spaces of display are not really brought alive. They are almost all single, flat map sheets. Not much diversity. Surely much is missing. Its very much the standard narrative: cartography is about power of kings, princess and churches. Land ownership dominates. Exhibition lacks the quirky, the provincial, the fun, social mapping, flows, etc, etc. All rather pompous and serious. Cartography is done by professionals, its a separate and special knowledge domain. Not clear what you're supposed to have learnt by the end. I'm glad I visited (and I'd recommend it if you're in London and have time) but it did not surprise me or challenge me.